2nd instar BMSB on border rows of slender spindle apple on June 26th, 2018. Brief: During commercial orchard scouting this week in Orange County we observed 2nd instar on slender spindle plantings along the perimeter of the block. All life stages of BMSB (with the exception of the 1st instar) found in the orchard will feed on fruit, especially during periods of dry hot weather. Begin scouting for both nymphs and adults during the upcoming week as temperatures begin to sore into the mid and upper 90’s. To date we have seen low brown marmorated stink bug (BMSB) adult trap captures that are well below threshold for management. In tree fruit blocks where scouting has shown nymphs, orchard management for the pest should be initiated. Increasing temperatures over the next week may increase BMSB movement into orchards. Scouting along orchard perimeters and placement of traps should be strongly considered. Insecticide tools with various degrees of efficacy for BMSB management. Scouting & Monitoring: BMSB is a perimeter pest, which tends to aggregate and feed along the orchard edge in highest numbers. Scout along the orchard block wooded edge utilizing a 1 BMSB adult per 100′ as a threshold for management. Place pheromone baited tedders or clear sticky card traps traps along the orchard border, applying a 10 trap per week threshold for applications to control the insect. Contact AgBio to order traps. Scout frequently along the orchard edge. Later in the season instruct your harvesters on what to look for by showing them images of BMSB adults and nymph stages. Have them notify you if any are found and in which rows and blocks require treatment. Over the next few weeks the insects will be building in numbers. Keeping well informed of their presence is critical to reduce damage from the stink bug complex in late varieties. Life Stages of the BMSB . Introduction: The brown marmorated stink bug is an arboreal insect, residing in woodland deciduous trees. Although the insect prefers an arboreal habitat, with woodland tree species providing nutritional and reproductive resources, in the Northeast it appears to move out of woodlands to orchards during periods of low relative humidity and the onset of drought conditions. The use of pheromone baited Tedder’s traps will intercept the insect as it makes it way out of the woods and into agricultural crops, including apple and peach. A weekly trap capture of 10 adults / trap is presently being used as the action threshold for management. A single adult within the orchard perimeter rows bordering woodlands or a single apple damaged by stink bug can also be considered as viable action thresholds for BMSB. 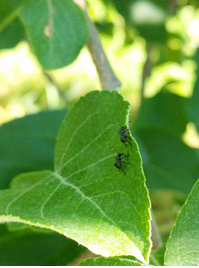 At trap threshold or during scouting observations for adults or nymphs during the first fruit injury, consider a first application to be made along the orchard edge as a perimeter spray directed only at the crop. Apply to blocks along the deciduous woodland, hedgerow or clusters of host trees such as catalpa, black locust, Tree of Heaven, maple, cherry or ash. The need for a second application can be triggered as the insect is observed on fruit and/or captured in pheromone traps using 10 BMSB adult per trap per week as indicated by the EDDMaps.org site or farm trap presence on site. The rational behind the use of perimeter management is based on two important facts. First, BMSB adults are not endemic as they do not reside or overwinter in the orchard. They will move from deciduous woodlands and or infested fields of vegetable crops initially into the orchard edge. Secondly, from historical orchard damage assessment, BMSB injury occurs within the first 90’ perimeter bordering wooded edge. In early August, 2012, was first observed BMSB developing a second generation. This was followed by movement into the orchard and increased feeding in red delicious beginning late August, with highest numbers of adults observed along the wooded edge of the farm. Across commodities, the highest damage levels from BMSB occur in Ag crops along the perimeter edge. Management along the orchard perimeter crop appears to be very effective and economical. It also preserves predatory mite late in the season when European red mite and two spotted spider mite tend to flare-up. Applications for management of BMSB should be made at the first available window using one of the most effective insecticides that will best fit your harvest schedule. Border row management in which applications are directed from the perimeter into the block should be considered as a first directed spray of a highly efficacious insecticide. However, if nymphs are found in the orchard WHOLE ORCHARD APPLICATIONS SHOULD BE CONDUCTED as the insect is now endemic and residing in the orchard compared to adults that are more likely to migrate in and out of the orchard edge. This application should then be followed up with border row applications at 7-10 days. Base follow-up applications on a cleaning and resetting traps with reapplications of border rows made upon a 10 BMSB adult trap capture. 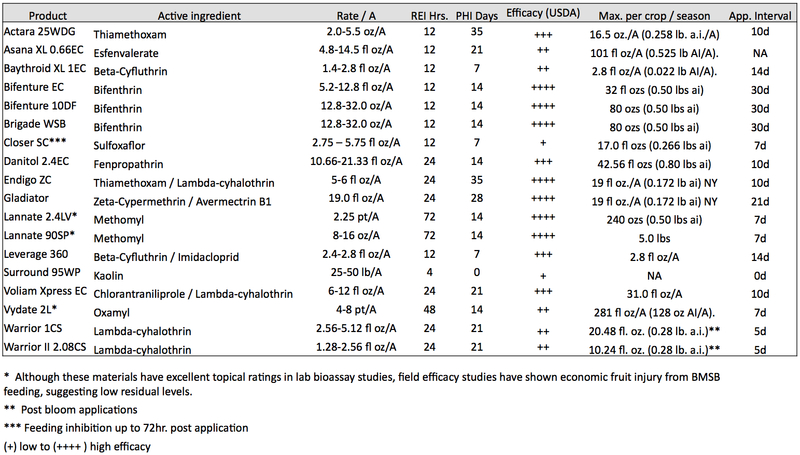 Insecticide efficacy for BMSB mgt. in NYS. The list of the most effective insecticides for BMSB management is found above. NYS labeled insecticides effective for use against the BMSB are available in four major classes including pre-mix formulations. Danitol is likely to be the best choice during the latter part of the season as its short pre-harvest interval and efficacy is a good fit. It is not as effective as Bifenthrin, however, it’s a very good choice for management of BMSB in peach as it has a 3-day PHI, strong efficacy, especially as a knock down insecticide, and also works well against the native stink bugs.